A majority of American households give to charity in some form or another--from local donations to food banks, religious organizations, or schools, to contributions to prevent disease or protect basic freedoms. Whether you're in a position to give $1 or $1 million, every giver needs to answer the same question: How do I channel my giving effectively to make the greatest difference? In Giving Done Right, Phil Buchanan, the president of the Center for Effective Philanthropy, arms donors with what it takes to do more good more quickly and to avoid predictable errors that lead too many astray. This crucial book will reveal the secrets and lessons learned from some of the biggest givers, from the work of software entrepreneur Tim Gill and his foundation to expand rights for LGBTQ people to the efforts of a midwestern entrepreneur whose faith told him he must do something about childhood slavery in Ghana. It busts commonly held myths and challenging the idea that "business thinking" holds the answer to effective philanthropy. And it offers the intellectual frameworks, data-driven insights, tools, and practical examples to allow readers to understand exactly what it takes to make a difference. Phil Buchanan is founding chief executive of the Center for Effective Philanthropy, a seventeen-year-old nonprofit that conducts research and advises the largest foundations in the country, including Ford, Hewlett, Packard, MacArthur, and Rockefeller. He is also co-founder of YouthTruth, a national student survey provider. He is a columnist for the Chronicle of Philanthropy, and his op-eds and articles have appeared in the New York Times, Stanford Social Innovation Review, and Financial Times. In 2016, the Nonprofit Times named him the nonprofit "influencer of the year," and he has seven times been among the newspaper's "power & influence top 50." He speaks around the country on philanthropic issues and lives in Lexington, Massachusetts with his wife and two daughters. 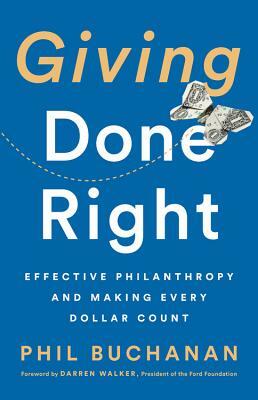 "Giving Done Right punctures myths and provides helpful guidance about the complexities and joys of philanthropy. Buchanan makes a persuasive and always practical case for why non-profits are not like businesses, why giving is not like investing, and how readers can find their own satisfying path to doing great good." "In Giving Done Right, Buchanan has widened his clear vision beyond foundations by providing a reliable guide for all donors-individuals, foundations, corporations and indeed recipients of charitable dollars-who are determined to do their charitable giving and spending the right way. Anyone resolved to get the biggest and wisest bang for their charitable dollars need look no further for guidance now that this experience-filled, reader-friendly book. "—Joel Fleishman, Director of the Duke University Center for Strategic Philanthropy, and author of Putting Wealth to Work: Philanthropy Now or Investing for Tomorrow?